It seems that, due to an unforeseen problem, Mowbray's Revenge won't actually work for most people. It's very strange that nobody has informed me of this, I mean the mod has been out for an extremely long time. Basically, it has a dependency to bodyCheckv2 that got left in somehow... The installer on our local site has been updated to include the missing files. If you already have a copy of MD:MR, the good news is that you can make it work by simply downloading Body Check and installing it into your copy of UT2004 as well. 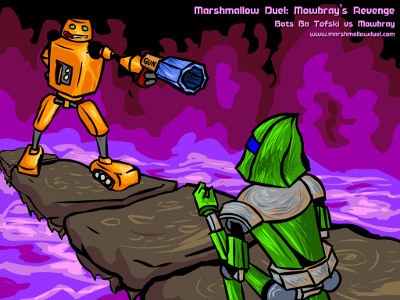 Nothing to do with Mowbray's Revenge per se, but I've just released a new version of the classic Marshmallow Duel which contains or improves upon everything that made the original Marshmallow Duel and Mowbray's Revenge so great. It's been a while since the mod was released and so anyone who cared to look will have known the winner of our character design competition. A huge congratulations to Killadee for his wonderful character Bots ba Tofski! So congratulations to Killadee for his great addition to the mod. 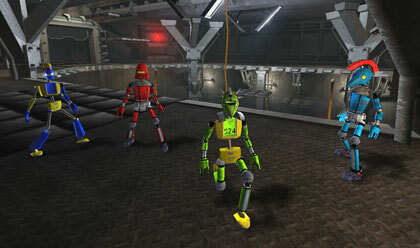 You can find Bots ba Tofski in the game, and in fact you have probably played the guy once or twice already! And so, after 7 months of work it gives us extremely great pleasure to release our first public beta of the mod!!! We hope you all enjoy it as much as we did making it, and find it a worthy successor to one of gaming history's timeless classics. So what are you waiting for? Head on over to the files page and download it now! Following our pre-release LAN party the other night, we've now compiled the footage into a full trailer. Go to the files page to download now, and see what the mod is going to look like! And a quick heads up on the release date, the mod will be out on the 13th at the earliest, 20th at the latest. This depends on how long it takes our mappers to add finishing touches to their maps. We figure a few days extra waiting should be worth some extra high quality maps! This is just a quick message so you all know that the Character Dev Kit has been updated to include a Maya 6.0 rig (previously there was only a 6.5 one). Thanks to Kizza for doing this! There are only 9 days left to go in the character design competition, so get cracking! Great news! The core of the mod is now final. This means that there are no bugs remaining (well, no important ones), the mapping tools and actors are complete, and there are no new features to be added. This puts us well ahead of schedule, so we now have more time to be working on cool stuff like maps and character models. Anyway, the point is: the mod is around 95% finished! With work on the mod strongly progressing, we feel confident in announcing a release date of the 13th of November. Prepare yourself! That's right, we are looking for talented modellers and texture artists to give their contributions. For a chance to get your creations into a mod, build up your portfolio and win a USB vaccuum cleaner (hehe), download the character dev kit from the files page and get started! For more information, and to announce your creations, head over to this forum thread. As many will have noticed, our site has been down for the last few weeks. This was due to some server issues we've had with multiple servers. The current server is looking good, and all these problems should now be fixed. There's a ton of new screenshots in the Images section of the site, so be sure to check them out! All materials shown are © 2005 the Marshmallow Duel : Mowbray's Revenge team and are their own work unless otherwise stated. All other logos and trademarks in this site are property of their respective owners. Opinions expressed are those of their respective authors and are not necessarily the opinion of the Marshmallow Duel : Mowbray's Revenge team. No materials within this site may be reproduced without author consent.